I'm Running to Eat! : Taco Night! Well I'm upright and in the kitchen. That's something these days. This viral thing has hit our family hard. Dh and I have been sick since the middle of February. We'll feel better for a day or two and then the fever and sore throat come right back. The kids have all been sick and ds2 and dd1 have both missed a whole week of school with it. Maybe we'll all be healthy in time for spring break! I may not be out on the track yet but I have made it back into the kitchen. (Can you hear my kids cheering in the background? LOL!) After running errands all afternoon, I opted for quick and easy tonight. I picked up a new cookbook while dd and I were at the library and I think it was written just for me: The Family Dinner Fix: Cooking for the Rushed by Sandi Richard. I flipped through it while waiting on ds to come out after school. Since I already had ground beef in the fridge I decided to try Soft or Hard Shell Tacos with Toppings for dinner tonight. Nothing new and exciting. 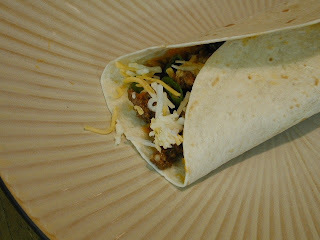 Just a quick and easy recipe to make good, old tacos without using a pre-packaged seasoning mix. Prep work was done in no time and dinner was on the table in under 15 minutes. The kids all ate it with no complaints. Dh said it was "okay". I think it was a little bland but next time I'll just serve it with some spicy salsa and maybe top it with a few slices of jalapeno. Brown ground beef in a large nonstick frypan at med-high intil no longer pink. Add spices while meat is browning, stirring occaisionally. Add ketchup and water after meat has browned. Reduce heat to a simmer. Meat mixture will thicken within 10 minutes. Meanwhile, chop green onion and cilantro and slice tomatoes. Rinse lettuce in salad spinner and spin dry. Set out toppings in small serving bowls on dinner table. Spoon meat mixture into tortilla and sprinkle with cheese. Add your favorite toppings. Roll up your tortilla, folding bottom up to prevent leaking. I'm glad that you're feeling well enough to cook! Those tacos look delish.